A lot of celebrities have seen wearing Casadei shoes and why not? It may not be as expensive as Lanvin’s that Salma Hayek was seen wearing at some premieres or Louboutin’s that Selena Gomez likes to prance around int but it sure is as elegant as any of those two. These pointy pumps for example looks like a $1500 pair of shoes but the price ranges only between $350-$450. This Gerbera colored one for example is only $344, that’s already a great price for the same look and quality. What you’ll love most about this shoe is the skinny stiletto heel. The thinner the heels are the sexier they seem, don’t you think? The heel measures approximately 4.5 inches and has no front platftorm so it would help if you have long and thin feet. The upper is made of suede leather and comes in Gerbera and Nero colors. 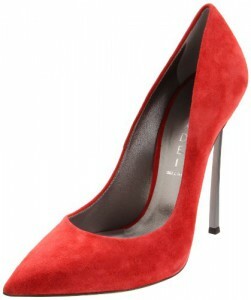 They have satin and patent pumps in different colors too but it comes in a higher price. I’d pair it up with tight pants (leather if you can), tight top and an open jacket for an even sexier look. Buy this Casadei shoe here! We’ve seen celebrities like Penelope Cruz in a sky high Casadei shoes. Now you can add up Vanessa Hudgens to the list. She recently rocked this shoe at a party at West Hollywood and she looked gorgeous! She paired it up with a shiny white suit but try it up with your little black dress and some silver accessories for a less flashy but same level of awesomeness! Actually there’s no need for too many accessories, a necklace would do since the shoe is catchy as it is. This Casadei sandal has a chain covered leather upper. The straps are made of leather covered in small chains and it’s amazing how detailed it is if you take a closer look. The slender stilettos measures approximately 4 inches. One thing I don’t like too much about the shoe is the sole which are very smooth. This shoe is not made to create traction so you better watch your step. Lastly, the original price is as high as its heel which is $1300. Good news is, you can actually get it through amazon at $611.33. That’s over 50% OFF!!! Buy this Casadei shoe here!